MERIDA, Mexico – Will December 21, 2012 fulfill the ancient Mayan prophecy as the end of the world or will it be the beginning of a new era of enlightenment? 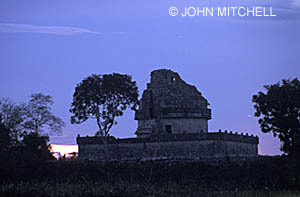 Banking on the latter, Mexico’s President Felipe Calderon has designated 2012 The Year of the Maya. This year-long festival of special events celebrates all things Maya and will include international exhibits, symposiums with renowned scholars, dance festivals, concerts, and regional culinary festivals. Facilities under construction for this special year include two new museums on the Maya, and the public opening of several new archaeological sites. Early Planning is Essential! Put a Stay at Hacienda Xcanatun on The Calendar Now. Savvy travelers are already reserving luxury accommodations at the historic and centrally located Hacienda Xcanatun (www.xcanatun.com).The elegant, boutique hotel is set on the outskirts of Merida, and recommended by Patricia Schultz in the second edition of her book 1,000 Places to See Before You Die. Guests enjoy a prime vantage point for sampling a luxe lifestyle and easy access to all the special events and new venues in and around Merida during The Year of the Maya. Almost around the corner from Hacienda Xcanatun, is Merida’s new archaeology museum: The Museum of the Mayan World (Museo del Mundo Maya). It is expected to open in October 2012. Interactive exhibitions will showcase rare Mayan miniatures and ceramic pieces, along with a collection of carved Chacmool statues. The Chacmool is often associated with the rain god Chac, and at other times served as an altar for offerings to the gods. 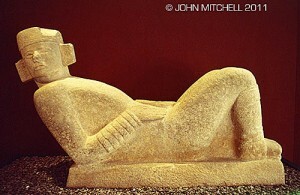 Chac Mool sculpture from Chichen Itza. Please click on the photo for more information. Another major exhibit will document the rise and fall of sisal and the sisal plantations in the 18th century. Sisal, a.k.a. green gold, was essential for making rope, critical to the shipping industry. It became the Yucatan’s most important cash crop creating 100’s of millionaires who built opulent plantations and a lifestyle to match. Other exhibitions will showcase Mexico’s ethnic groups. A botanical garden and an IMAX theater will also be housed in the new facility. The Palace of the Mayan World (El Palacio del Mundo Maya) is under construction 7 miles from Chichen Itza, in the town of Yaxkaba. Promising a different kind of experience, The Palace will replicate a sacred Maya city when completed, where visitors can experience how life was organized and the daily activities in a holy center. For bikers, a trail from Chichen Itza to The Palace runs over a sacbe or “white road” similar to those great ceremonial avenues connecting ancient Maya centers. Archaeological sites unavailable to the public will be opened, and several older archaeology sites are being further restored with improved access roads and facilities. 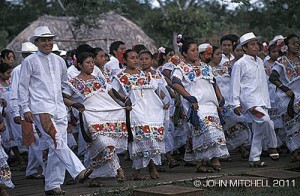 Yucatec Maya Dancers. Please click on the photo for more information. The Best Place To Stay? Hacienda Xcanatun! Hacienda Xcanatun was once one of the largest and grandest sisal plantations in the Yucatan. Current owners Cristina Baker and Jorge Ruz, son of one of Mexico’s most famous archaeologists, spent five years transforming the estate into a luxe manor house hotel with acres of gardens and manicured jungle. From the beginning they have instilled the Maya legacy of living in harmony with nature into their management style. This commitment extends to the intimate spa, where Carolina Martinez, Xcanatun’s head Maya therapist, trained by her shaman (healer) grandfather, creates unique treatments from ancient Maya rituals. Very popular with guests are Hacienda Xcanatun’s customized private day trips guided by skilled archaeologists and ecologists native to the Yucatan. These trips should be arranged in advance when booking 2012 reservations! Accommodations feature 18 high-ceilinged suites, each with a private balcony or patio. All are air-conditioned and individually decorated in a Carib-colonial style with hand-carved furnishings, antiques, and marble bathrooms. Two swimming pools provide a calm oasis deep in the gardens. Casa de Piedra, their gourmet restaurant, highlights enticing Fusion Yucatecan specialties. It is ranked among the top 50 restaurants in Mexico. From 2011 through 2012 nightly rates range from $260 – $345 single or double occupancy (Christmas/New Year’s slightly higher). The rates include continental breakfast. Taxes and hotel service charges are additional.